Maurizio Cossutti and Alessandro Ganz guide us to discover the new C 45 and the renewed Bavaria line: new aesthetics and high quality, this is how the German giant is changing. In Bavaria is ongoing almost a “Copernican revolution” and the merit, we can say, is also of Cossutti Yacht Design that brought new life to the German shipyard, with a change of perspective on the concept of the new models, both from aesthetic and constructive point of view. Bavaria showed up at the Boot in Düsseldorf with three brand-new boats: Bavaria 65, Bavaria C 50 and Bavaria C 45. The meeting with Maurizio Cossutti and Alessandro Ganz gave us the opportunity to talk about the new models. 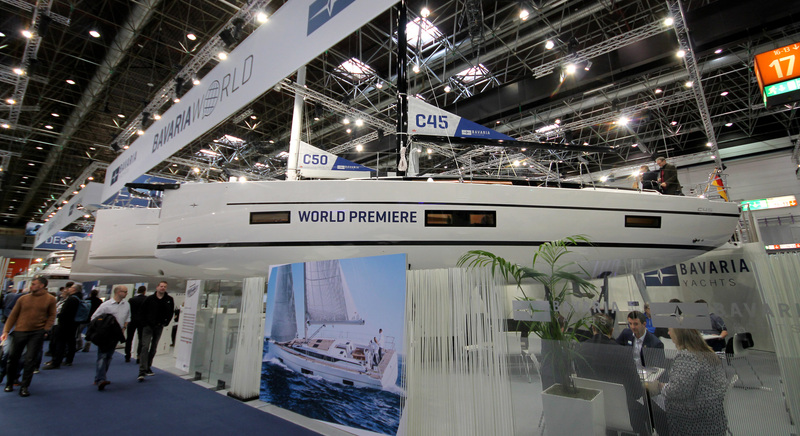 With them we discussed the characteristics of the new range, focusing in particular on Bavaria C45, presented at the German boatshow in three versions: holiday, style and ambition. This distinction is inspired by motoring, in order to have three versions of the same boat with some significant differences. The holiday version points to a historic market for Bavaria, the charter one; the style version, instead, is a step forward for cruise ship owners who want a more equipped and comfortable boat; in the end, the ambition version is destined to cruiser sailors who looks for a very comfortable boat but also with remarkable sailing performance.